It’s funny how things click together. A couple of years ago when I was wondering the suburbs of Detroit I stumbled upon this massive residential job site. The site was surrounded by a large screen- well of course that just sparked my interest. Then of course this past summer while in Detroit, I stumbled back across the finished product, a modern concrete house in the traditional Birmingham neighbor with a striking modern landscape. The landscape was particularly modern because of the use of Corten, land form and the use of mass planting. 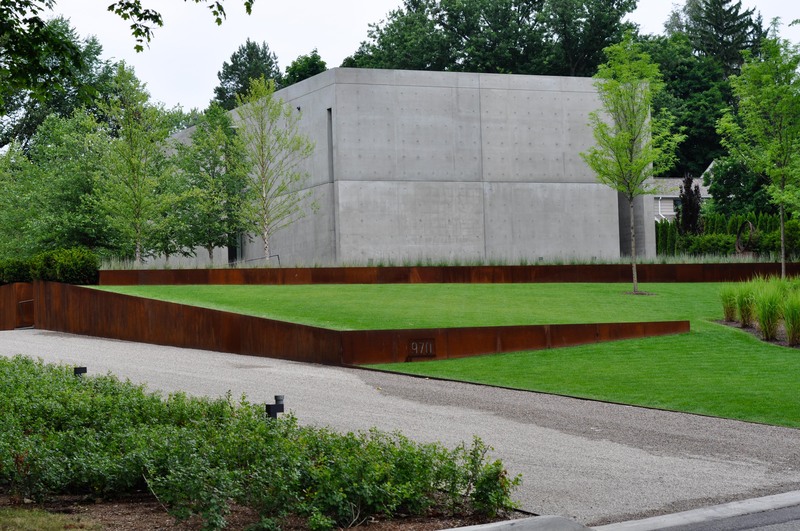 As a design element, corten steel is more often seen on the coasts and not much here in the Midwest outside of commercial design. I stopped and took photos of the house, but had the wrong lens for the camera so never posted. A few weeks later, while on Pinterest I came across an image of the garden attributed to Andrea Cochran, which perfectly aligns. Then just this week my wife handed me an old article from WSJ Magazine with the home owner and house featured (LINK to article here). Between the two sources it provided the complete story of the garden – the home owners tastes and desires with the landscape architect’s knowledge and aesthetic. (I was also able to get more details from some other sources). Above two images I took during this summer (2014). The above two images are taken from Andrea Cochran’s website. The first is of the street view of the home and the second is of the courtyard space behind the home. 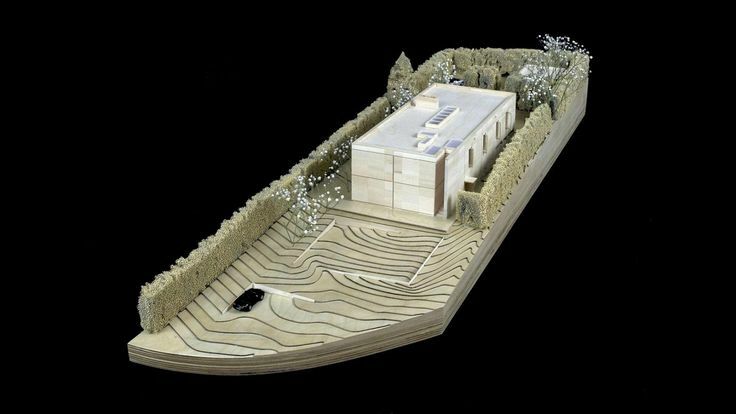 Here are more details and schematics of the home via the architect of the home, Steven Sivak. (LINK to more photos here). The plans are for the garage in the back to be covered in ivy and be a giant green box. This will be a unique area since it is already cocooned into a courtyard hedge. The above two images are taken from Andrea Cochran’s website. The cor-ten sculpture is created in the style of Chris Burden and installed by MBM Fabricators. Here are some of the plants IDed in the design of the project. This entry was posted in G A R D E N S, gardening, Gardens, Inspiration, Landscape, Landscape Design and tagged Andrea Cochran, Birmingham, Cor-ten, Corten, Detroit, garden design, grasses, landscape design, Michigan, Michigan gardening, modern gardening, modern gardens, Ornamental grasses, Wall Street Journal, WSJ by Nick. Bookmark the permalink. Thank you so much for recognizing our work, and linking to our website. 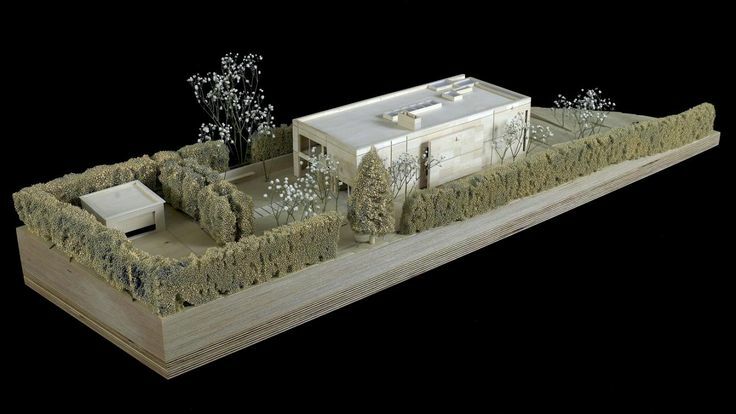 The Dresner residence is such a unique and beautiful home, from the landscaping all the way to the imitation Chris Burden I-beam sculpture. I put a link on our site (projects page,Dresner residence) to the original art project being done, its really cool. I wish I could have been there to see the Iron workers being instructed how to place and angle the pieces just so! I bet they had a lot of laughs over beers that night.